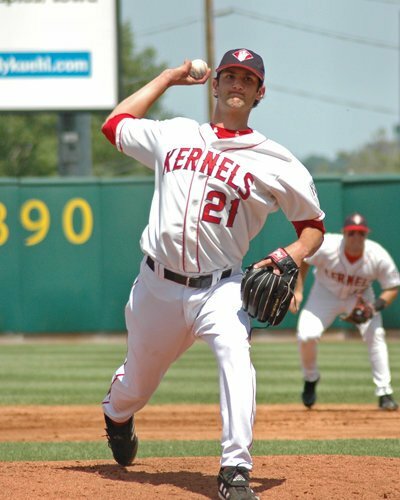 On June 27, 2006, Nick Adenhart made his final start in Cedar Rapids and led the Kernels to a 1-0 win over the Burlington Bees to improve to 10-2 on the season. Adenhart worked eight shutout innings striking out six batters while allowing three hits and three walks in the victory. Nick Adenhart posted a 10-2 record and a 1.95 E.R.A. in 16 starts for Cedar Rapids in 2006. Adenhart struck out 99 batters in 106 innings of work. He was selected to the 2006 Futures Game roster, played in the 2006 Midwest League All-Star game and earned Midwest League post season All-Star squad honors. Cedar Rapids finished the season with a 65-74 record under manager Bobby Magallanes. Nick Adenhart was a bright young pitcher who played for the Cedar Rapids Kernels in 2006, and was a rising star in the Los Angeles Angels organization. Adenhart made his MLB debut on May 1, 2008. 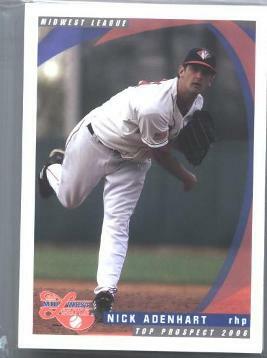 Adenhart compiled a 1-0 record with a 6.00 E.R.A. in four career starts for the Angels. Only hours after Nick’s 2009 season debut on the mound for the Angels, a drunk driver tragically killed him on April 9, 2009 at age 22. 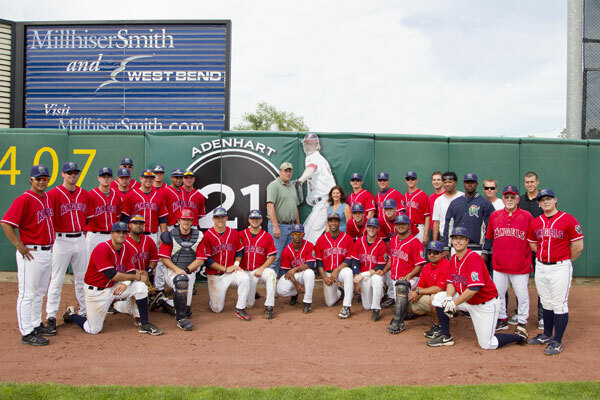 Nick Adenhart’s family would like to honor him by awarding a $1,000 scholarship in his memory. The Kernels Foundation is privileged to administer the scholarship on behalf of Nick’s family. On May 14, 2006, Nick Adenhart improved to 6-0 on the season and led the Cedar Rapids Kernels to a 2-1 win over the Clinton Lumberkings. Adenhart worked seven innings striking out eight batters while allowing one run on seven hits in the victory. 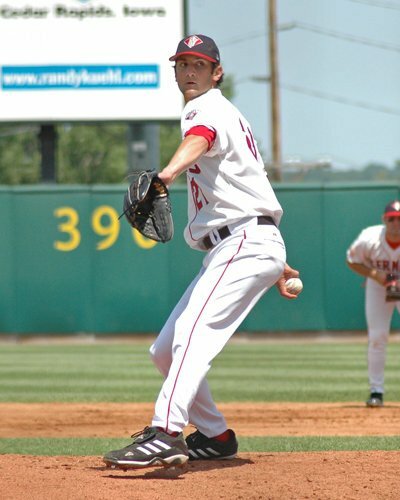 Nick Adenhart was a bright young pitcher who played for the Cedar Rapids Kernels in 2006, and was a rising star in the Los Angeles Angels organization. Adenhart made his MLB debut on May 1, 2008. Only hours after Nick’s 2009 season debut on the mound for the Angels, a drunk driver tragically killed him on April 9, 2009 at age 22. Adenhart compiled a 1-0 record with a 6.00 E.R.A. in four career starts for the Angels. On May 9, 2006, Nick Adenhart led the Cedar Rapids Kernels to a 9-0 victory over the Dayton Dragons. Adenhart worked 7 shutout innings striking out nine batters while allowing one hit and one walk to improve to 5-0 on the season. On April 18, 2006, Nick Adenhart led the Cedar Rapids Kernels to a 4-1 victory over the West Michigan Whitecaps. Adenhart worked 6 2/3 shutout innings striking out eight batters while allowing three hits and one walk at Veterans Memorial Stadium. Applications are being accepted through the Kernels Foundation for the Nick Adenhart Memorial Scholarship. Nick Adenhart was a bright young pitcher who played for the Cedar Rapids Kernels in 2006, and was a rising star in the Los Angeles Angels organization. Only hours after Nick’s 2009 season debut on the mound for the Angels, a drunk driver tragically killed him on April 9, 2009 at age 22. Nick’s family would like to honor him by awarding a $1,000 scholarship in his memory. The Kernels Foundation is privileged to administer the scholarship on behalf of Nick’s family. The deadline for submitting applications for this scholarship is April 27, 2012. Applicants must be a graduating high school senior from an area public or parochial high school. The applicant must plan on attending a two or four-year accredited college or university and be registered in 12 or more hours per semester. He or she must have played an organized sport in the last two years (does not have to be a school-sponsored sport), be a great teammate, demonstrated hard work and determination, and have a clear vision of career goals. Scholarship applications are available through area school guidance offices, or may be downloaded by clicking here. For more information, please contact Doug Nelson at 896-7614 or email at doug@kernels.com. 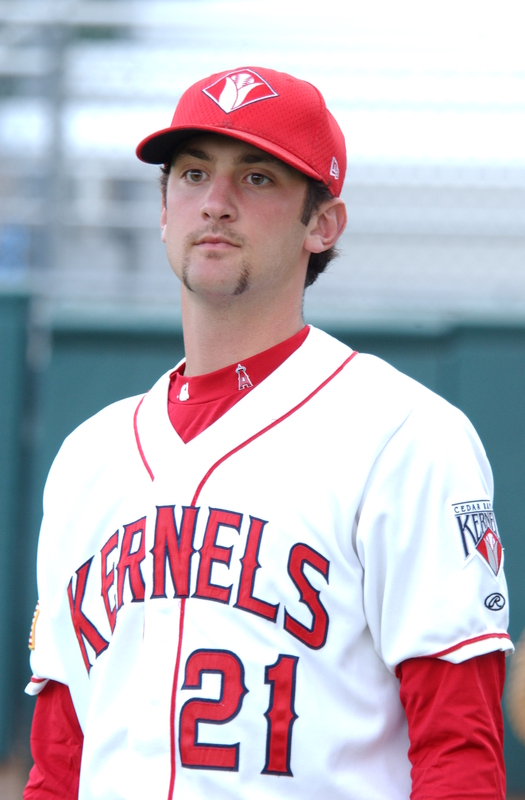 On April 12, 2006, Nick Adenhart earned his first win for the Kernels allowing three runs over six innings of work as the Kernels defeated the Peoria Chiefs 7-3 at Veterans Memorial Stadium. Adenhart struck out six while allowing four hits and a walk in the victory. Nick Adenhart posted a 10-2 record and a 1.95 E.R.A. in 16 starts for Cedar Rapids in 2006. Adenhart struck out 99 batters in 106 innings of work. He was selected to the 2006 Futures Game roster, played in the2006 Midwest League All-Star game and earned Midwest League post season All-Star squad honors. Cedar Rapids finished the season with a 65-74 record under manager Bobby Magallanes. 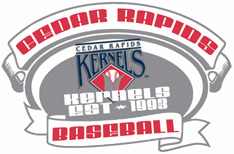 Cedar Rapids, IA – Applications are being accepted through the Kernels Foundation for the Nick Adenhart Memorial Scholarship. scholarship on behalf of Nick’s family. determination, and have a clear vision of career goals. guidance offices, or may be downloaded from the menu to the left or by clicking here. For more information, please contact Doug Nelson at 896-7614 or email at doug@kernels.com. 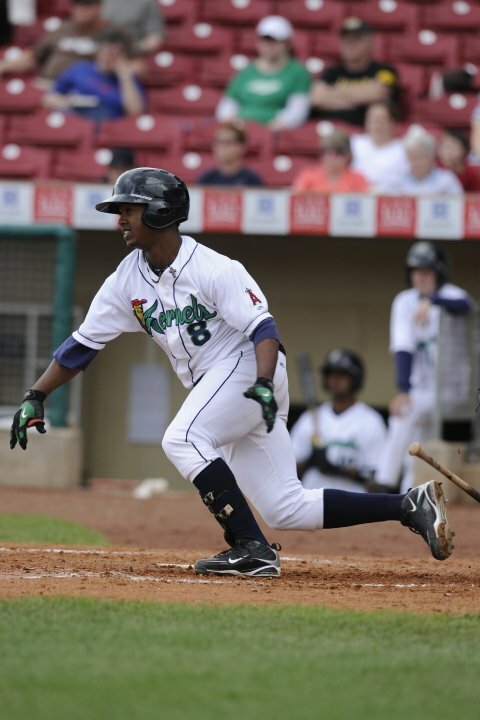 The Cedar Rapids Kernels have been well represented at the Futures Games that have been held as part of the MLB All-Star game festivities each year since 1999. 15 Kernels players have been selected as members of the minor league showcase including two who have made appearances in multiple years (Ramon Ortiz and Jeff Mathis). This past season, three Kernels (Hank Conger, Luis Jimenez and Mike Trout) played in the game and Hank Conger took home the game’s MVP trophy. What does this have to do with Cael’s Collection? 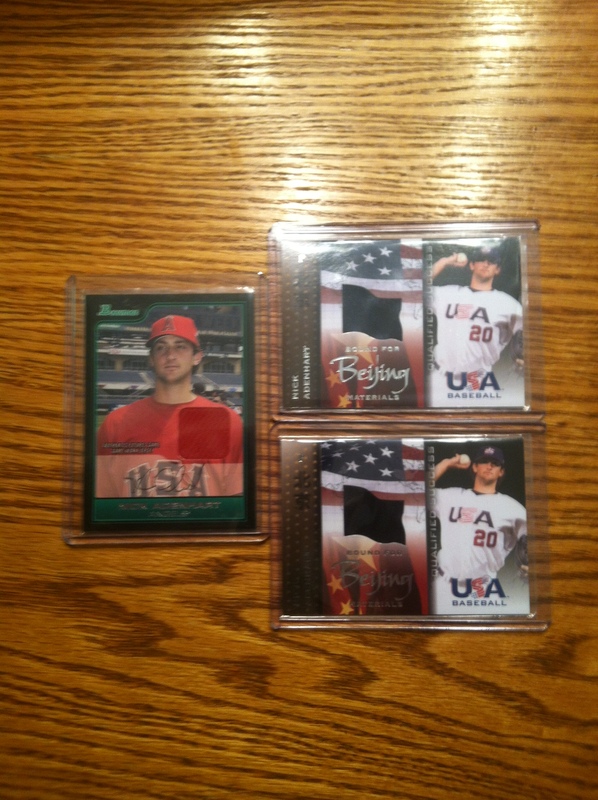 Topps has produced game used jersey cards of each of the games that have been included in their Bowman Draft Picks and Prospects sets and now more recently in their Topps Pro Debut minor league sets. Today’s card has multiple stories to tell. 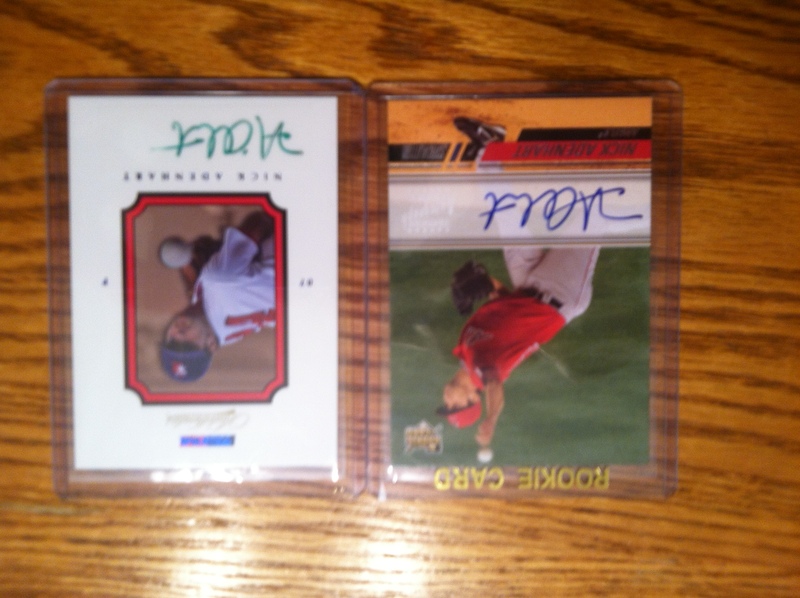 The 2001 Ramon Ortiz game used jersey card FGR-RO was one of the earliest game used cards companies started producing to boost interest in the industry. Almost every new set produced now has versions of game used jerseys, bats, hats etc. to garner interest of the collector. The second story is the one of warning. Ebay can be great for finding those cards that are tough to find. However, the postal service and Ebay sellers can often cause damage to the card while it is en route. This card wasn’t packaged very well and arrived with large creases on the back. Its tough to prove to the seller you aren’t a crackpot trying to take advantage of them and I figured it part of the deal utilizing Ebay to collect. This card cost less than $5 including Shipping and handling so I wasn’t out a great deal. 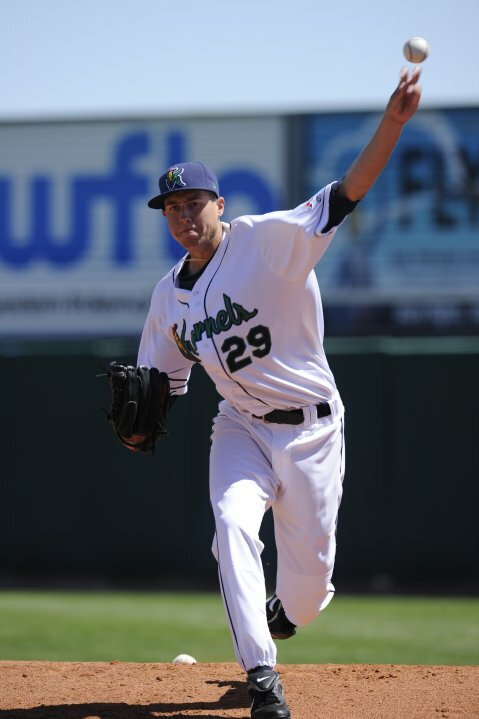 Ramon Ortiz was the first Kernels player to make the Futures Game roster. He was a member of the inaugural World team roster in 1999 and was selected in 2000 as well. Ortiz was the last Cedar Rapids pitcher to throw a no-hitter at Old Veterans Memorial Stadium when he shut down Quad City (12-0) on August 7, 1997. Ortiz posted a 11-10 mark and struck out 225 batters in 1997 leading the team with a 3.58 E.R.A. The Kernels finished with a 63-75 record under manager Mario Mendoza. Ramon Ortiz has compiled a 85-82 record with a 4.93 E.R.A. during his 10 MLB seasons playing for the Angels, Reds, Nationals, Twins, Rockies and Dodgers.